Sir Martin Sorrell turned his company WPP from a shopping cart manufacturer into one of the largest advertising holding companies on the planet. After 30 years at the helm, Sir Martin stepped down as WPP chief—and launched WPP competitor S4 Capital just a short time later. 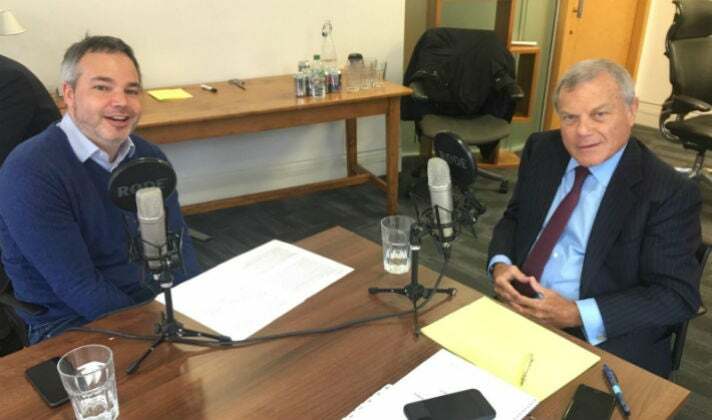 In the OMR Podcast, Sir Martin talks about how he plans on scaling up his new baby, what advertisers can do in a world of walled gardens and his impressions of the digital marketing world at present. In April 2018 Sir Martin Sorrell vacated his post at WPP after 3 decades in charge amid alleged personal misconduct and misuse of company assets. But if you thought the 73-year-old would fade off into the sunset of retirement, you would have been mistaken. Six weeks later, in May 2018, he snatched up Derriston Capital and transformed it into advertising holding company S4 Capital. After acquiring digital agencies Media Monks (for USD 350m) and MightyHive (for USD 150m), Sorrell’s new company already has a market capitalization of USD 600m and employs 1200. “Our motto is ‘faster, better, cheaper,'” says Sorrell to Florian Heinemann in the OMR Podcast, who stood in for OMR founder Philipp Westermeyer. “Faster simply means being active 24 hours a day, better stands for using technology aggressively and cheaper means efficiency.” Sorrell went on to say that S4 is strictly pursuing a digital agenda and seeks to only acquire digital agencies. “Walled Gardens are dominating digital business at present. Their reluctance to share data is increasing,” says Sorrell. Something he says he completely understands, especially against the backdrop of the current debate on data security. “With the advent of the internet and the demise of local businesses, many brands saw an opportunity to create direct client relationships for the first time. Platforms, however, have driven a wedge between brands and their customers,” he says. As prices increase, there is added urgency for brands to advertisers to amass their own data pool. “The biggest battleground at present is in the control of data”, says Sorrell. “There is a somewhat unfortunate Brexit analogy here. One of the slogans was “Take back control.” And that is exactly what many advertisers want to do.” S4 Capital stands for this model exactly, as the purchase of MightyHive shows. The agency supports companies in performing agency tasks in-house. The whole principle of S4 Capital is based on developing first-party data content and media sales with clients. “When I left WPP, I looked to see in which areas revenue was growing. And those were first-party data, digital content and digital media planning–exactly those areas we are pursuing now,” says Sorrell. To hear more on what Sorrell had to say about China and its platforms, his opinion of the largest advertising holdings and why he thinks Microsoft is getting it right at present, check out the new OMR Podcast. A look back at the impressive past few decades in the career of Sir Martin Sorrell. What do his stops at Saatchi & Saatchi, WPP and now S4 Capital have in common? Sorrell initiated an IPO on the London Stock Exchange with S4 relatively quickly, while other large digital companies like Airbnb and Uber keep putting it off. What went into the decision for Sorrell? Two larger deals made headlines. How did the acquisitions of Media Monks and MightyHive go? MightyHive supports companies in the development of in-house solutions. How does that fit in Sir Martin’s view of the advertising industry? Where are there growth opportunities in the agency business? What are Sir Martin’s thoughts on the current state of the largest agency holding companies? What is Sorrell planning on doing with S4 that will make it stand out from the classic agency model? What is his impression of the biggest adtech companies beyond the big four, like the Trade Desk, AppNexus, etc.? The West is dominated by US companies and a handful of European digital companies. Can Chinese behemoths like Alibaba and Tencent really shake up the status quo? The digital giants are being faced with increased regulation in the US and Europe. Could that be a chance for UK companies post-Brexit? What is it about Microsoft and CEO Satya Nadella that has impressed Martin Sorrell?